The CadNSDI is provided in geodatabase and shapefile format, and represents the cadastral components of the Public Land Survey System (PLSS). The CadNSDI is generally published annually in NAD 83 HARN. A geodatabase in the State Plane Coordinate System is also available for download. Previous publications of the CadNSDI are available as Related Records. The Montana Public Land Survey System comprises townships, sections, section subdivisions, and special surveys. A discussion site for national parcel and cadastral data to support the Cadastral NSDI. Landing page for federal land records resources. CadNSDI Montana is the current, authoritative source for the most accurate GIS representation of the PLSS. The name “CadNSDI” comes from the FGDC’s Cadastral Subcommittee. In the spring of 2014, the Montana State Library (MSL) assumed the management and publication of the Montana CadNSDI. In partnership with MSL and Premier Data Services, Inc., the Bureau of Land Management (BLM) continues its stewardship of the Montana CadNSDI on federal lands. The CadNSDI is published with new adjustments on an annual basis according to FGDC Cadastral Publication Standards. It makes use of Montana’s Mapping Control Framework as the basis of its coordinates in areas where mapping control is available. Grants are available from the Montana Land Information Act grant program to collect survey control to be used in future CadNSDI adjustments. The Mapping Control theme lead accepts survey control on an ongoing basis, and if applicable, this control will be used in future adjustments to improve the accuracy of the CadNSDI. 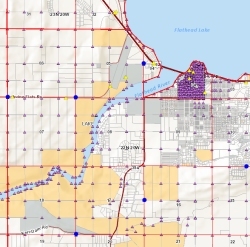 The CadNSDI supports the development of Montana’s Cadastral Framework, Administrative Boundaries Framework, and other Montana framework datasets built upon the PLSS geography. Below is an example of improved Cadastral parcel data following an adjustment of the CadNSDI in that area. If your own data partially aligns to the CadNSDI, you may want to adjust your data to the latest publication. In addition to the applications described in the section below, you can use the following services in ArcMap or in ArcGIS Online to visualize and query where adjustments have taken place across the state as well as the status of current and future adjustments. Explore completed areas of adjustment, learn about how the CadNSDI is adjusted, and discover how other datasets rely on its accuracy. Published by the PLSS Work Group, this story map provides an overview of the PLSS and its components. The map below shows Public Land Survey townships in Montana where CadNDSI accuracy improvements have been proposed, are in progress, or have been completed, as well as where mapping control is available. Improvements to the CadNSDI occur through adjustments using survey control data. To contribute survey control to be used in future adjustments or to propose a new area for adjustment, email geoinfo@mt.gov.